It is the policy of the MMRA to encourage and promote the development of Mount Merrion as primarily a family friendly residential area which maintains the unique environment and character historically associated with the area. The MMRA will seek to ensure that any proposed commercial development will be sympathetic to and in keeping with the needs of residents. The MMRA regularly checks the DLR Planning Departments website for planning applications and publishes all relevant applications on the Mountmerrion.ie website. 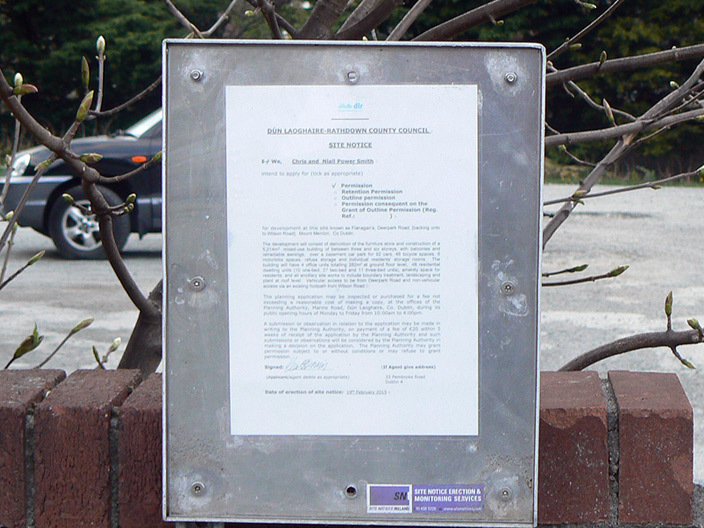 All planning applications must also be displayed by means of a notice at the site to be developed. If your neighbour submits a planning application to the County Council then you are encouraged to examine it and inform yourself of any possible negative impacts the proposed development may have on your property, the streetscape or the landscape. Do not depend on another neighbour or the MMRA to do that for you. What concerns you personally may not interest other residents. We encourage anyone submitting a planning application to discuss it with their immediate neighbours before submitting it to DLR CC. This can help resolve any concerns in advance, save you time and money and maintain good neighbourly relations. If you have any concern about a planning application you should look at the details of the proposed development by visiting the planning office and asking to see the file. You are entitled to request a copy of the plans which will be supplied on payment of €20. If some aspect of the application concerns you then put your concerns in writing to the Planning Departments within the prescribed time limits. The cost of submitting an observation or an objection is €20. MMRA Role in the planning process. MMRA will normally review all commercial planning applications from the point of view of the community at large and may at their discretion make relevant observations to the planning authority. Again we encourage residents to review any planning application which they suspect may impact their property, the locality, local amenities, the environment, the land or streetscape or their personal interests and make their views known to the planning authority. The MMRA committee will only get involved in reviewing developments planned by individual residents when the proposed development involves material change to the streetscape, the environment, or material changes to properties covered and protected by DLR Council AR11. This is a general statement of policy and is subject to revision from time to time.